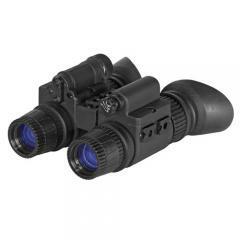 ATN NVGOPS153A PS15-3A Night Vision Goggles FREE SHIPPING! Maneuver in the dead of night as easily as if it was daylight while armed with the PS15-3A Night Vision Goggles from ATN. Featuring multi-coated glass lenses and not one, but two image intensifier tubes, the goggles boast clearer and more detailed imagery in the darkest field and combat conditions. The dual tubes serve to improve depth perception, for greater and more effective mobility while in use. Able to absorb and convert the faintest light rays and equipped with a built-in infrared illuminator, the PS15-3A provides the vision clarity needed to read maps and navigate abandoned buildings in total darkness. A comfortable head mount offers hands-free use, ideal for missions where mobility is essential. Constructed from ruggedized aluminum, nitrogen-purged and sealed with premium O-rings, the goggles offer the waterproof and shock-resistant durability needed to standup to the most intense and unforgiving environments. ©2002-2019 CopsPlus.com: ATN NVGOPS153A PS15-3A Night Vision Goggles FREE SHIPPING!